Untreated asthma can lead to long-term complications in the respiratory system including chronic obstructive pulmonary disease, emphysema and respiratory failure. The causes of asthma are due to genetic predisposition, smoking, inhaling second-hand smoke and allergies. Some other triggers of asthma attacks include cold air, exercise induced asthma and upper respiratory infections. Asthma can strike anyone at any time. According to the Center for Disease Control, it is estimated that over 18.9 million American adults and 7.1 million American children living with asthma. The numbers are growing rapidly and early treatment is important to reduce complications from the disease. Dirt and dust need to be removed from your home at least every week. Dust is a severe allergen and can feed dust mites that are also an allergen. Bedding, curtains and carpets can harbor dust and dust mites. Wash curtains and bedding often and possibly consider replacing carpets with hard flooring. Using your air conditioner keeps your air filtered and clean and to keep clean air flowing in to your living space. Opening windows for fresh air can let in pollens and can trigger asthma. If your home is too damp, dehumidify the air. If your home is too dry, use a humidifier, but don't let the air get too moist. Pet dander is highly allergenic. Use an allergy reducing pet shampoo often. Note how weather affects your asthma and make the necessary adjustments. If cold air triggers an attack, try to stay inside or cover your face and try not to breathe cold air. If heat triggers your attacks, try not to overexert yourself in the heat. Mold spores in your home can be a "silent" asthma trigger and is hard to get rid of. Open windows for brief periods to prevent the air from becoming too humid inside in winter. Wear facial protection if you need to clean your basement or attic and check your sinks, cupboards and around your tubs for mold growth. Use a bleach solution to clean mold. Things are actually blooming all year round and when they bloom, pollen is released. Pollen exposure also occurs when grass is being mowed. Try not to open windows in the early morning hours and at dusk to reduce high pollen counts in your home. Pollen counts are highest between 5 a.m. and 10 a.m. and at sunset. Wear facial protection if you must cut your lawn. Strong chemicals used for cleaning can have fumes that irritate the lungs. Try to use safe all-natural cleaners that are free from fumes. Keep an eye on chemicals in your foods. Some preservatives like sulfites can trigger asthma attacks. Food allergies are a more common cause of asthma in children, but may be triggers for adult asthma. Keep a food diary to watch for foods that may trigger asthma attacks. Highly allergenic foods include berries, nuts, shellfish and dairy products. Certain medications may trigger an asthma attack as a side-effect. Known substances that cause asthma attacks are aspirin, anti-inflammatories, some blood pressure medications and some food additives (dyes). 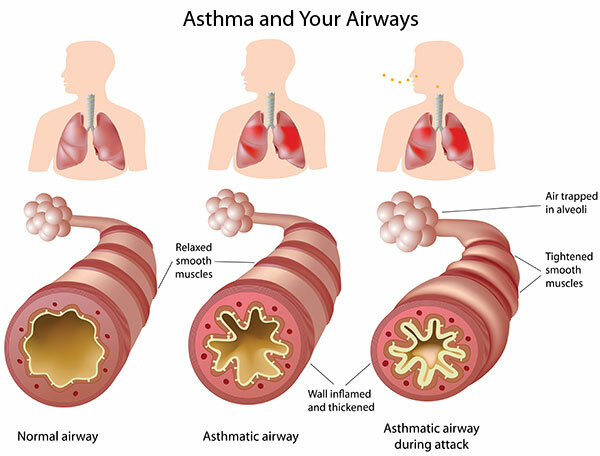 Asthma is caused by inflammation of the airways. Onions are loaded with anti-inflammatory properties. Try not to eat raw onions, which can be irritating. Saute them gently and eat cooked in foods. Three cups of coffee a day is a beneficial treatment for asthma. It was actually one of the first known medical treatments for the disease. Caffeine can help open up constricted airways and reduce the amount of attacks. At least 300 mg of vitamin C daily can help reduce asthma attacks by 30%. The airways need vitamin C and most asthma sufferers do not get enough. Drink a glass of orange juice or eat bell peppers, strawberries or broccoli. Ginger is a great remedy for many ailments. You can take a small piece of ginger (about one inch) and steep it in a cup of boiling water and drink as a tea. You can add honey for taste. Make a tonic with ginger, fenugreek seeds and honey and allow it to soak overnight and drink in the morning to clear toxins from the lungs. Ginger can also be eaten raw. Figs can help clear mucus from the lungs and promote breathing. Soak three figs in a glass of water overnight and drink the water in the morning. Then, eat the figs before you have breakfast. This will help the asthma relieving properties absorb into your body quickly. Massaging mustard oil and camphor into the chest will help to open blocked airways and relieve an asthma attack. This remedy can be used up to several times a day until you feel relief from breathing difficulties. Honey is a very ancient asthma remedy and can be taken by the spoonful, used in tea, hot water or inhale the aroma. You can also mix one-half teaspoon of cinnamon and make a paste with a teaspoon of honey and take at night before you go to bed. Honey is also a natural allergy reducer. The pollen in the honey desensitizes the body to allergens in the area where the honey came from. This is why it is best to buy honey that comes from a one-square mile radius of where you live. This oil can help open breathing passages and the following technique will humidify the air in the room you are in and open your airways at the same time. Place 10 drops of straight peppermint oil into a pot of boiling water; continue to simmer until the water until it evaporates. This material is a very effective and inexpensive filter for allergens and dust. You can place a piece of cheesecloth over any type of venting systems that blow air into your home. Use a piece over air conditioner and heating vents, box type fans and even over your window screens. Lemon contains anti-oxidants and vitamin C which is beneficial to people suffering from asthma. Squeeze the juice of a lemon into water and add sugar to taste. Make a tea out of garlic and drink to help clear congested lungs. You can also boil 10 to 15 cloves of garlic in milk and then drink the solution. Eucalyptus oil vapors help to open up the airways and eases breathing. Use 2 or 3 drops of eucalyptus oil in your vaporizer, a bowl of steaming water or place some on a towel and breathe in the vapors. Getting enough Omega-3 fatty acids may prevent asthma altogether. It is very important that children get enough Omega-3 fatty acid foods to prevent getting asthma. Yogurt is high in vitamin B12, which reduces reaction to sulfites in foods. Eating just two cups of yogurt daily can help reduce attacks. First, the capsaicin in chili peppers acts as a powerful anti-inflammatory and can help reduce inflammation in the airways. Second, spicy foods increase and thin the mucus in the airways and make it easier to breath. Get regular exercise. Even if your asthma is exercise induced, studies have shown that exercise in those who treat their asthma can actually help the lungs become stronger. Discuss a healthy exercise program with your doctor and start slowly. Increase the amount of exercise as you are able. Eat a healthy diet. Include adequate amounts of vegetables and fruit every day. These can help increase your immune response to triggers and allergens and keep your body healthy. Keep a healthy weight. Being overweight increases the workload on the lungs and makes it harder to breathe. Avoild cigarettes. Smoking is one of the biggest triggers for asthma. If you smoke, it's time to think about quitting. If someone in the home smokes inside, have them step outside to smoke. Second-hand smoking is unfiltered and very toxic to the lungs and body. Treat gastro esophageal reflux/heartburn. If you have uncontrolled heartburn, small amounts of the caustic stomach acids can be inhaled into the airways and irritate them. Treating these conditions can help and sometimes prevent asthma attacks. Practice deep breathing. Give your body the oxygen it needs by taking slow, deep breaths through the nose. Try eating "vegan." Animal proteins are a known allergen and can increase the incidence of asthma. Just make sure you get enough protein and vitamin B from other sources. Practice relaxation. Too much stress can trigger an asthma attack and anxiety can make them worse. Take a relaxation break every day and de-stress yourself. Learn useful techniques to prevent anxiety during an attack, which could make the attacks worse. Cut down on salt. We do need a little salt in our diet, but too much is unhealthy. Salt can cause the airways to react more easily to asthma triggers.